Why would thousands of commuters approve of the decision to shut down a bridge on a major highway? Is it because they look forward to adding more time to their already long drive into work? Could it be they eagerly anticipate the adventure of finding new routes amidst already clogged roads? Hardly! It’s because they understand the bridge is unstable. They fear what might happen. The tilting bridge could collapse. That’s a picture of life in the home a child with mental illness (MI). Life with MI can be as flimsy as a house of cards. Normalcy and peace in the home can be as fragile egg shells. There’s instability and no one knows what might happen next. The uncertainty instills fear. Violence may or may not occur. But change is inevitable. That’s a troubling reality, a sad fact. It’s hard for moms to accept their child won’t be the same. Can others understand? Getting a new house, a new spouse, or a new job can be both fearful and wonderful. Wonderful because of the exciting adventure ahead. Fearful because of the changes that will occur. Change is unsettling to most people. How can we cope? What can we do when we sense a new trial looming on the horizon? This next part of our story provides one answer. I turned to my unchangeable Savior. Christ offered stability in the face of oncoming instability. In March Chris behavior became alarming. He acted strangely, but different than the first time he suffered a psychotic episode. The first incident happened when he made an odd comment. “I found the verse in the Bible about what should happen to a child who hits his parents,” he told me. “I think I got off easy,” he replied. Chris still didn’t understand that his behavior was a result of his MI. Prior to his first psychotic episode he’d never been violent to us or anyone else. Quite the contrary. He was a loving and appreciative son. Often he’d thank me for making dinner. That conversation signaled turmoil simmering inside Chris, tormenting him once again. I braced myself for another incident. Whatever that would be. Early one week he didn’t communicate with us. He didn’t respond to our questions or share in our conversations. He stopped smiling. Within that week his behavior deteriorated quickly. New red flags popped up. When I insisted he respond to us, he became belligerent. “Don’t you ever shut up?” he’d ask. Each day seemed worse. It took him longer and longer to respond. “What did you say?” he sometimes asked. I sensed he was having trouble thinking. It seemed hard for him to process information. Thankfully my teaching experiences helped me know how to respond. Some of my former students had significant processing delays in their thinking. They simply needed to hear a question repeated. So I’d repeat my questions to Chris slowly, using a minimum of words. Still he struggled to understand. Everyone noticed Chris’s difficulty thinking. His brother, Robert, pointed it out. Chris’s teachers called to share their observations. The band director reported similar behaviors. It progressed to the point that Chris wouldn’t even answer at all. No matter how many times we’d ask him something. No matter how slowly I’d post the question. Chris even started putting his fingers in his ears when I spoke to him. “That’s typical teenage behavior,” some of my friends told me. Trying to comfort me. I knew it was worse than typical teenage behavior. God gives mothers intuition and insight into their kids. Especially the most vulnerable ones. Dear Father, I sense Chris is heading to another psychotic episode. Chris seems to be unraveling again. He’s become unstable again. Ease my anxiety. I don’t know what we’ll be facing this time. Help me focus on Your stability in the midst of instability. Thank You that You never change. I know You’ll be faithful, just as you were last year. Once again I need Your peace, protection, and guidance. The psychiatrist told us Chris was heading for different kind of psychotic episode. His first one caused his thoughts to race. This time his mind was slowing down. By Thursday of that week Chris sat motionless with his head down. I knew I needed to take him to the psychiatrist. “Chris you need to stay home tomorrow. I’ll take you to see Dr. Newman,” I informed him. Chris silently refused. He just glared at me. Reluctantly I allowed him to go to school. Friday was the day Chris’s physics teacher had breakfast with his students at a local diner. Our whole family frequently joined them. After breakfast Howie would take the boys to school on his way to the train station. I would drive my car to work. That morning the waitress was much slower than usual. In spite of that, the boys wanted to stay and finish breakfast. “I’m not going to have time to take the boys to school. Can you drive them?” Howie asked me. “I’ll drive you. Chris can take my car to drive himself and Robert to school,” I answered quickly. The time pressure caused me to make a poor decision. Chris was in no condition to drive. When I got to work I did the final preparations for the Math and Bible Olympics. They were scheduled to be held that afternoon. I put in a call to the psychiatrist. Hoping he could prescribe a minor adjustment to Chris’s medication. “I’m deeply concerned. I need to see him first thing tomorrow morning,” he said with urgency in his voice. His tone scared me. Chris has the car. What if he completely loses it while driving home from school? I have to get to him as soon as possible. The elementary school principal could fill in for me. She had helped with all the plans for the Olympics. The only problem was that she was pregnant. Due any minute. “I need to meet Chris at his school before he leaves. I can get the Olympics started. Will you be able to run them?” I asked her. “Sure. As long as I don’t go into labor!” she agreed. Dear Father, please be the stability in this day. Keep her from going into labor. Prevent Chris from driving before I get to him. I left work at 2:00 PM and flew to Chris’s school. I arrived there just before he left. And followed him home. That night was Gym Night at the high school. All the students were divided into two teams (by last names, according to the alphabet). Chris had signed up for two events. One of them was Simon Says (much like the band march off). With him being son unstable, I was afraid of what he might do. I feared that if he got eliminated and the opposing team cheered, he would run to attack someone. I watched him pacing before his events. Thankfully, he behaved normally during those events. As I watched him compete, his focus amazed me. It seemed impossible for him to hold it together under all the pressure of a gym filled with noisy spectators. Gym Night lasted several hours. All that time I studied Chris. Sitting poised and ready to leap off the bleachers if he acted peculiarly or violently. Dear Father, please help Chris behave normally. My emotions are churned up. Please be the stability of my heart tonight. Thankfully, the evening ended without incident. The next morning Howie and I drove Chris to see Dr. Newman. After one hour of observing and Chris and talking with us, Dr. Newman determined that Chris’s psychotropic medication was no longer working. I didn’t know what the future held for Chris. But it was enough that I knew Who held his future. God had been our stability during this instability. He’d continue to carry us through whatever was in store. Yes, life with MI can feel as flimsy as a house of cards. 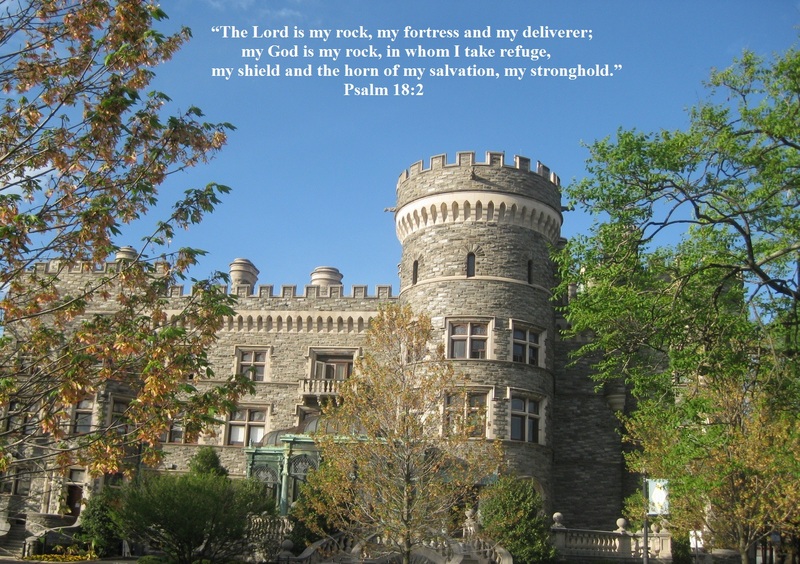 But God is our Rock and Stronghold.